Less than two months after Netanyahu condemns arson attack on synagogue dedicated to murdered teens, gov't demolishes it. 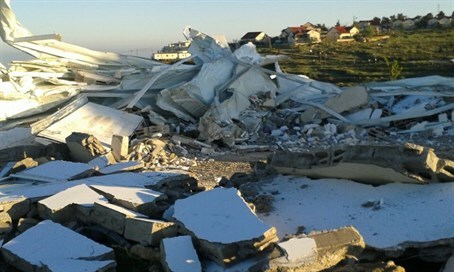 A Carmei Tzur synagogue built to commemorate the three young Israelis who were kidnapped and murdered in 2014 was demolished overnight by the IDF’s Civil Administration enforcement division. Residents were shocked to discover the ruins of the destroyed house of prayer on Thursday morning. The synagogue was built in 2014, near the site where Eyal Yifrah, Gilad Sha’ar, and Naftali Frenkel were abducted and murdered. Locals said they felt betrayed by the move, which came less than two months after Arab arsonists set fire to the synagogue, burning holy books and damaging the building. Prime Minister Binyamin Netanyahu quickly responded to the arson attack, pledging swift justice for those responsible. Following the arson, residents rebuilt the synagogue, and given the Prime Minister’s rhetoric, expected the government would offer protection for the house of prayer. Despite the demolition, residents pledged to continue to gather at the site for prayer services and religious study. MK Shuli Mualem (Jewish Home) condemned the razing of the synagogue, comparing it to February's arson attack. "The synagogue which was built in memory of the three [kidnapped] youths naturally became a target for terror and desecration by Arabs. But [now] the Arabs' work has been done someone else. What they [the Arab arsonists] began, the Civil Administration completed."